Energy markets are undergoing a fundamental transition as the world moves toward a low carbon, clean energy economy. What does this transition mean for the future of the oil industry, including majors like Chevron, ExxonMobil, Shell, Total, ConocoPhillips, and BP? Are there similarities between changing oil market fundamentals and those causing the recent collapse of the U.S. coal industry? 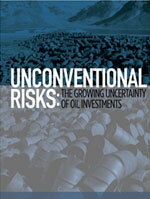 Unconventional Risks: The Growing Uncertainty of Oil Investments, addresses a series of transformative changes in the global oil market, including sharply rising costs of reserve replacement, competition from new technologies, a global imperative to quickly reduce carbon, and the potential for demand disruptions. The report considers the financial stress these factors are causing and looks at possible future directions for these companies. Listen to the streaming audio of the press conference! In 2011, near the height of U.S. coal consumption, As You Sow published a report highlighting the growing financial risks to the U.S. coal industry, the Financial Risks of Investments in Coal, which predicted the structural basis for what has become a permanent decline of the industry. The paper argued, correctly, that some of the most profitable companies in the U.S. at the time would soon be weakened by changing market fundamentals. This paper considers current structural changes in the oil market that have the potential to contribute to a weakening of the oil industry. While the coal and oil markets differ in certain aspects, similarities include higher capital costs (in the case of oil, higher costs associated with finding and producing new reserves); increased competition; global demand constraints due to climate and other air pollution-related regulations; alternative and substitute technologies; and increased social activism focused on industry. Higher Cost Reserves & Supply Competition – One of the most significant challenges for oil in a carbon constrained economy – in which demand for oil is slowing or falling — is competition for remaining market share. Today, the majority of low cost reserves are owned by nationally controlled oil companies (NOCs). As oil majors’ current supplies of conventional reserves are depleted, they must find new reserves, generally at greater cost. Independent oil companies, including the majors, are thus becoming the world’s high cost producers, making them less competitive. This trend has been broadly masked by the past decade’s record high oil prices. This trend has recently had major repercussions for the profitability of the majors, which are competitive with lower-cost NOCs only to the extent they have similarly low cost oil, or to the degree oil prices are high enough to cover their costs of reserve exploration and development. At prices of $30 and even $40-plus dollars per barrel, most oil majors are not competitive. Yet, so long as oil price is high enough to ensure the profitability of the majors over the long term, for example $80 per barrel or more, high oil prices simultaneously create market conditions that accelerate long-term demand destruction, ironically reducing the frequency and extent of oil price rebounds in the future. Financial Indicators of Structural Risk – As a result of these trends, the financial fundamentals of oil majors have been declining over the past decade with balance sheets marked by falling cash positions, rising debt levels, declining profits, and flat or marginally increasing production, all of which began before, and was exacerbated by, the 2014 oil price drop. Increasing Capital Expenditure: Between 2000 and 2014, total capital expenditures of the oil majors grew 308%, from $41 billion to $166 billion. Despite these increases in capital investment, the total oil equivalent production from the oil majors decreased 1.7% in the same period, reflecting in part, the rising costs of replacing reserves. Reduced access to conventional supplies of crude has required most independent oil companies, including the oil majors, to develop unconventional, higher cost resources (e.g., deep water, Arctic, and tar sands), which are often in extreme and remote locations and require complicated extraction processes, increasing costs of production. As a result, the cost of producing the marginal barrel of oil is increasing. Declining Profit Margins: From 2011-2013, oil prices were at the highest levels in history. Yet, due to spiraling costs of finding and developing new resources, among others, oil majors’ profit margins have declined. The majors’ average return on equity has been declining since it peaked in 2005, reflecting decreasing profitability over the last decade. Mounting Debt: From mid-2000 to 2014, debt among oil majors has more than tripled as the oil majors took on debt at unprecedented rates. Debt appears to have supported capex, operations, share buybacks, and/or dividends, as profit margins declined. Whether this increasing indebtedness is reflective of historically low interest rates, or was necessary to fund the increasing costs of reserve replacement and dividends, the oil majors’ debt positions are structurally distinct from what they were 15 years ago. Recent credit rating downgrades show that rating agencies are starting to take notice. Decreasing Cash: Also from 2000-2014, several of the oil majors had significant decreases in cash reserves, resulting from increased spending, lower profit margins, maintenance of dividends and/or share repurchases, and debt servicing. In particular, Exxon’s cash reserves have plummeted since 2008, ConocoPhilips’ cash peaked in 2010, and Chevron’s cash peaked in 2012. An eroding end cash position and a weak revenue outlook heightens the potential for credit access and repayment problems. Oil Price Collapse Exacerbates Financial Situation: The oil majors’ decade-long trend of financial stress has been exacerbated by oil prices collapsing in mid-2014. It is unclear how long the oil majors can weather the low price market, even with 2015 reductions in capital expenditures and a focus on low cost projects. The majors’ balance sheets also face increased pressure as the companies continue to support high dividends to assure investors of the companies’ financial strength, even when doing so requires companies to cannibalize earnings and potentially take on more debt. Demand Constraints & Mounting Social Pressures – Compounding changing market and financial conditions, an array of technological, environmental, political, and social factors currently render the scale of future oil demand growth uncertain. The potential for peaking or even declining demand should raise significant concern for oil majors and investors. 2015 Paris Accord & other regulations. The 2015 COP21 Paris Accord solidified global policy and resulted in a multilateral commitment to maintain global warming below 2-degrees Celsius — a goal requiring dramatic greenhouse gas emission reductions. At the same time, an array of laws across the world are being enacted to respond to climate change. Critically, the majors’ oil demand projections do not comport with a 2-degree scenario. Energy emissions decoupling from economic growth. In 2014, the world saw the first modern example of economic growth decoupling from energy emissions on a global scale, undermining the long held assumption that fossil fuels are required for economic growth. Competitive technologies. The majors’ own reporting recognizes the significant power that fuel efficiency and other technologies, including electric vehicles, have to markedly reduce oil consumption. These technologies are rapidly penetrating the regions from which the majors expect most future oil demand increases to emerge. As the world moves to address climate change, and as new regulations and technology slow or reduce demand for oil and other fossil fuels, risk to oil and gas companies escalates. Already, demand for oil has stabilized and even fallen in OECD countries, despite rising gross domestic product, due primarily to the success of fuel efficiency standards and technology innovations. In an increasingly low carbon economy marked by declining oil demand, marginal oversupply can sufficiently decrease price so that higher cost producers become unprofitable. This market positioning has created permanent vulnerability for oil majors. This paper does not argue that any future is foretold for oil majors or the larger community of independent oil producers — only that acknowledging signs of change and planning appropriate action is imperative. While each company must forge its own path, shareholders must be confident that oil majors are sufficiently proactive in remaining competitive; there is tremendous opportunity cost in delaying responsive action. 1. Shrink to grow. Majors have the option of divesting areas of their business that are not profitable at low oil prices, and operating as leaner, stronger companies. This is the strategy recently adopted by ConocoPhilips and discussed in depth by a recent Carbon Tracker analysis. 2. Yield companies, Master Limited Partnerships, Royalty Trusts. Yield companies, Master Limited Partnerships (MLPs), and Royalty Trusts offer tools for oil companies to create stand-alone business units out of their riskiest divisions or assets, protecting the stable and value generating elements of their companies, reducing capital costs for their primary company, and helping to resolve mounting threats to liquidity. 3. Legacy production. Rather than pursuing unconventional resources, the majors could continue to produce their remaining conventional reserves, which are substantial. This strategy is likely be more successful in combination with diversification, including diversification into renewable energy resources. 4. Diversify into growing areas of the energy sector. It is becoming evident that investment in sustainable technology is now more likely than oil to have a place in the emerging low carbon economy. Total provides an example of an oil and gas company successfully diversifying into low carbon technology. 5. Consulting. Like Xerox and IBM, which successfully shifted from hardware into services in the face of market and technology changes, the majors have specialized expertise they can offer oil markets. Indeed, the majors already do provide significant consulting services to NOCs, an area which could feasibly grow. History is replete with companies that failed to recognize the inevitability of change in their markets. This paper examines the claim, which is echoed to some degree by all oil majors, that there is little risk to the companies’ ability to conduct business as usual. While acknowledging the importance oil has played in the successful economic development we have experienced over the past century, it is incumbent on investors, markets, and the oil companies themselves, to recognize the growing markers of change that will affect their future. Once dominant players in world markets, oil majors now share problems found at many risky companies, including increasing cost structures, deteriorating financial fundamentals, changing demand for their product, and management that has failed to address key areas of risk. This report considers oil majors’ present and future prospects, and the market forces that, over the next three decades, will reshape them.